Regular exams are an important part of your child’s oral health. We take pride in providing our patients with first class care. There are times when it is necessary to remove a tooth. We provide the necessities to ensure a comfortable procedure. By closing off spaces where bacteria can enter, a filling also helps prevent further decay. Contact us now for more information. 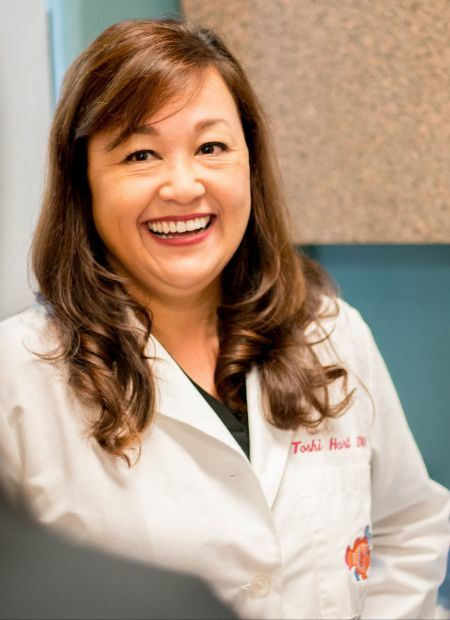 Toshi Hart, DDS is a general dental practice devoted exclusively to the dental needs of infants, children, and adolescents in the Modesto, Turlock, and Ceres areas. Dr. Toshi Hart and our staff of dental assistants, all mothers themselves, are trained to work specifically with children and provide not only the technical skill but also the gentle care to make children feel comfortable in the dental chair. At the office of Dr. Toshi Hart, we are committed to providing a comprehensive suite of dental services in Modesto and the surrounding areas. Fluoride is effective in preventing cavities, tooth decay, and in preventing plaque build up. Dental sealants are plastic resins that bond and harden in the deep grooves on the chewing surface of your child’s tooth. Come take a trip with us under the sea! Come join us on a wonderful adventure under the sea with Nemo and friends. Our Finding Nemo themed lobby will have your children enjoying themselves while they wait in a comfortable and friendly environment. They will ask to return time and time again. In order to continually improve we rely on our client base to provide input on their visit, overall experience, personal concerns, and suggestions. Please take a moment and leave us a review. Look below to see past customer experiences. 2 out of 3 of my children get anxious to go to the dentist but the staff at Dr. Harts has never failed to show the most care and compassion while treating my children. They have great teamwork, skill and patience when dealing with uptight children. Dr. Toshi Hart and her staff are amazing. I thank God that there is a Dentist office like this office for my daughter to go too to feel safe and comfortable. Everyone in the office was great. With four kids, Dr. Hart and your staff made the visit a breeze. Thank you!! We have been with Dr Toshi Hart for many years for my special needs son, Jordan. Thanks to you & all your professional staff especially Theresa who regularly cleans my son's teeth.. Good job!! We always have fabulous experiences with Dr Toshi and her staff. My daughter used to have a lot of anxiety regarding the dentist and now she enjoys going. I thought we'd never find a dentist that we loved as much as our previous pediatric dentist, when we moved. I was so very impressed and satisfied with our visit. I can't wait to bring my boys back and recommend to all their friends. Thank you. We have been with Dr. Hart since we moved to the area over 14 years ago. We have been extremely happy with everything and everyone in the office. We love Dr. Toshi Hart. After a terrible experience with another childrens dentist in town, Dr. Hart has been great for my kids (who don't panic because they have a dentist appointment) and I get to sit back and relax, read, check my emails. FABULOUS!! Thank you to Evelyn for being so respectful while talking to me and Tyler. Her approach and communication with us was not demeaning and I was comfortable enough when she came to get Tyler that I stayed in the lobby. Of course we love Dr. Hart! My son who has special needs goes to Dr. Toshi Hart for many years now. We are very happy with his care, she explained many things regarding his dental work, and she really spends time--even stops by the room to say hi 🙂 staff are gentle and patient! Thanks. My son has been a patient of Dr. Hart's for many years. We are very happy with the services provided by Dr. Hart and can only say great things about the office staff!! Do you still provide balloons to the kids like you used to at the old office? This is by far the best place I've ever taken my son to. It's definitely comforting knowing my son is in great hands! I recommend this place to EVERYONE! My kids have been coming to Dr. Hart for almost 10 years and have always loved there visits....Until I had an awful experience with the Office Manager. Unfortunately I had to find a new dentist. I am sincerely disappointed with my daughter's last two appointments. I had scheduled her to have her sealants done after her cleaning on July 30th. At that appointment I was informed I would have to come back and the sealants could not be done that day. I returned on August 9th and was kept waiting for an hour. Dr. Hart had an emergency with a patient.. The support staff left my child in the chair for an hour and never offered to let me know what was happening or how much longer it would be. At minimum they should have apologized and offered to reschedule the appointment. I was not acknowledged by the staff until I left with my daughter and no sealants. There was not even a follow up phone call. I understand emergencies happen but the support staff should have updated all the patients who had been waiting for an extended period. There was no customer service at all. You ask that we call you 24 hours in advance to cancel appointments. My families time is just as important as yours. I am disappointed and my daughter does not have her sealants. We have been loyal customers since both of my daughters were infants. I am sincerely disappointed and now am contemplating taking them to another dentist after this experience. Hi, letting you know that http://ProFund-365.com can find your business a SBA or private loan for $2,000 - $350K Without high credit or collateral. Our focus is on your peace of mind by helping your child achieve optimal oral health in a comfortable environment. We believe in continual education to ensure your children take excellent care of their teeth for years to come.